Do you have your wedding coming up or know someone who is getting married soon? 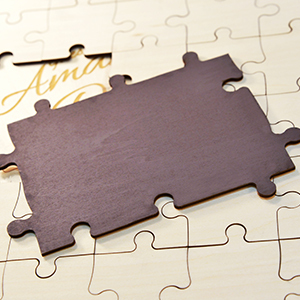 What better way to get your guests to leave a message to the happy couple than with a personalized wooden guest book puzzle. 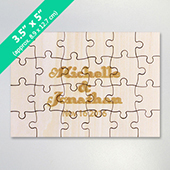 Personalized wooden puzzles are great for your guests to write a message on a piece of the wooden puzzle piece along with their name. 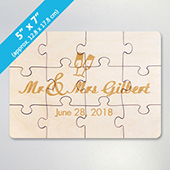 After all your guests have left their message of greeting, put the puzzle pieces together around the middle large jigsaw puzzle piece which contains a personalized laser engraving of the bride and grooms name. Great as a display piece as a momento of you wedding. 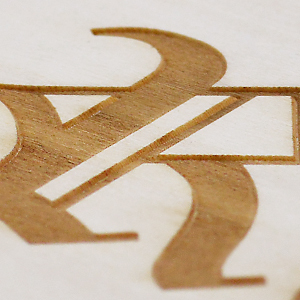 You can use any text or even image to tailor make this part. It's entirely up to you. 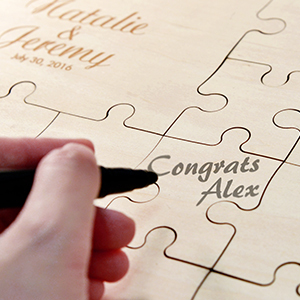 Most couples would put their names and date of their wedding in this part in plain text or some who might know a bit more about design, would add some artwork in a vector file and submit it to us. If you prefer not to fiddle around with artwork, simply use our online wedding wooden puzzle maker and type in your text. We'll get the rest done and have it delivered to you wherever you are. 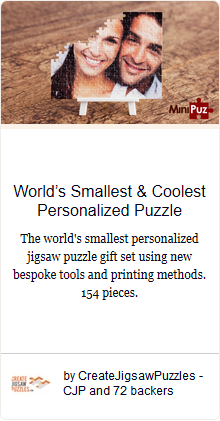 We have a number of different number of pieces for you to choose from to match your number of guests and also a number of different puzzle sizes. If you need an exact number of pieces puzzle set or a specific size, contact us to see what we can do for you. 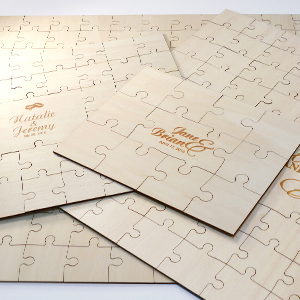 We do the engraving of your names and text onto the puzzle using pinpoint laser technology to ensure a high quality production output that is sure to go perfectly with any wedding reception. Choose to add text only or add some vector graphics. The choice is yours. We use premium 3mm plywood material for your personalized wedding wooden puzzle. The front contains a middle piece for engraving onto and is treated in a way that can be written on the puzzle pieces without any difficulties. 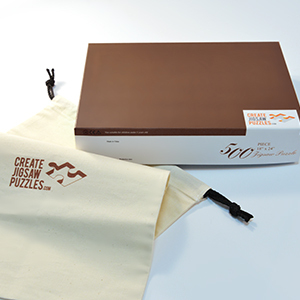 The back is printed in dark brown. 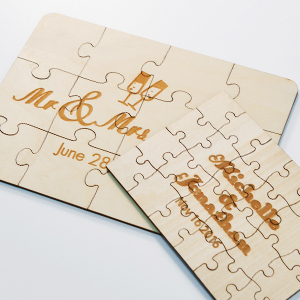 There is a beautiful camp fire smell from the wooden material which adds to the beauty of this great wedding keepsake. 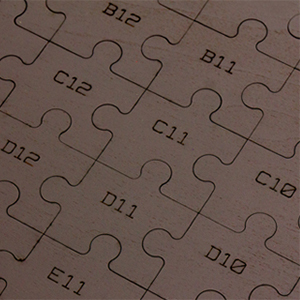 For your convenience, we have added the option to include laser engraved numbering on the backs of each individual puzzle piece so you can easily put the puzzle back together to see .